This thesis investigates noncoherent multi-channel ultra-wideband receivers. Noncoherent ultra-wideband receivers promise low power consumption and low processing complexity as they, in contrast to coherent receiver architectures, relinquish the need of complex carrier frequency and phase recovering. Unfortunately, their peak data rate is limited by the delay spread of the multipath radio channel. Noncoherent multi-channel receivers can break this rate limit due to their capability to demodulate multi-carrier signals. Such receivers use an analog front-end to separate the received signals into their sub-channels. In this work, the modeling and optimization of realistic front-end components is addressed and their impact on the system performance of noncoherent multi-channel ultra-wideband receivers is analyzed. With a proposed generalized mathematical framework, it is shown that there exists a variety of noncoherent multi-channel receiver types with similar system performance which differ only in their front-end filters. It is also shown that analog multipliers introduce strong interference due to higher-order mixing products. 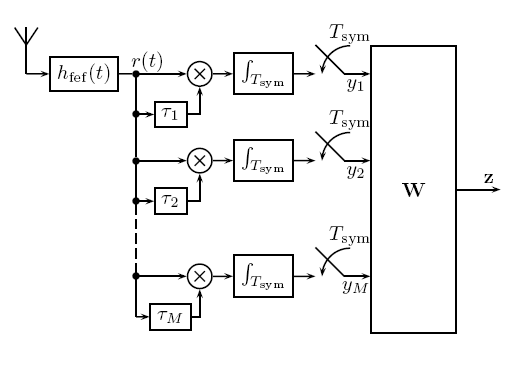 To analyze the impact of such interference on the performance of the receiver system, a Wiener-Hammerstein system model is introduced for the multiplication device. It is shown that the receiver performance strongly depends on the input power of the nonideal multiplier devices. A proposed mixed-signal integration device is able to suppress nonlinear cross-products between data carriers. Passive filter structures are analyzed for this purpose. It is shown that the optimized filter outperforms the reference system using an ideal sliding window integrator because it is able to mitigate more system noise. Additionally, an enhanced signal detection is introduced which is able to mitigate undesired nonlinear effects and hereby reduces the bit-error rate. Finally, a hardware example of a noncoherent multi-channel receiver is presented which proves the feasibility to design and manufacture such receivers with today’s technologies. This Ph.D. research is conducted in the framework of the NOFDM project, a collaborative project funded by the Austrian Research Promotion Agency (FFG), grant number 825899. Architecture of the noncoherent multichannel autocorrelation receiver frontend and technologies to be used in the prototype system.